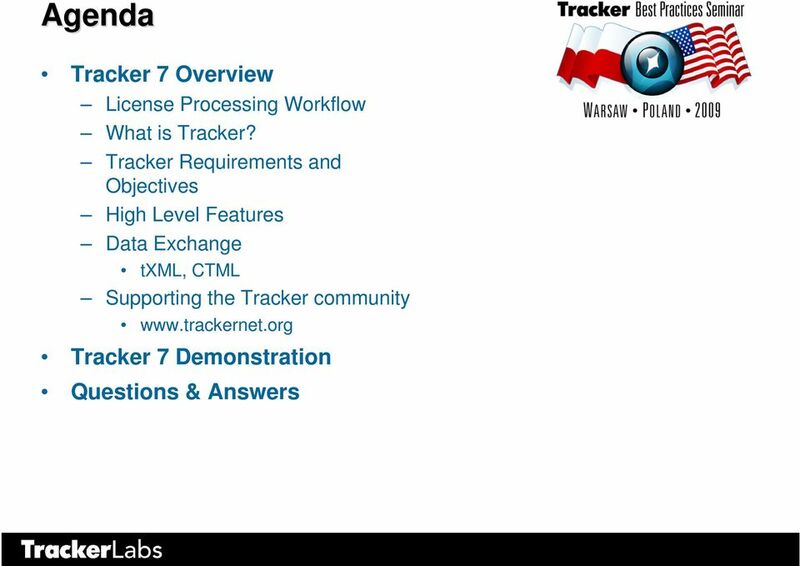 Download "Tracker 7. 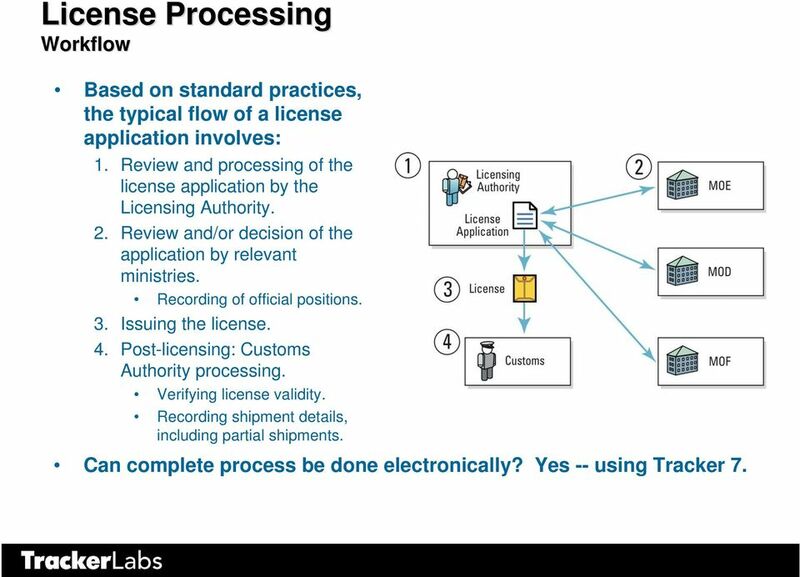 System Overview"
3 License Processing Workflow Based on standard practices, the typical flow of a license application involves: 1. Review and processing of the license application by the Licensing Authority. 2. Review and/or decision of the application by relevant ministries. Recording of official positions. 3. Issuing the license. 4. Post-licensing: Customs Authority processing. Verifying license validity. Recording shipment details, including partial shipments. Can complete process be done electronically? Yes -- using Tracker 7. 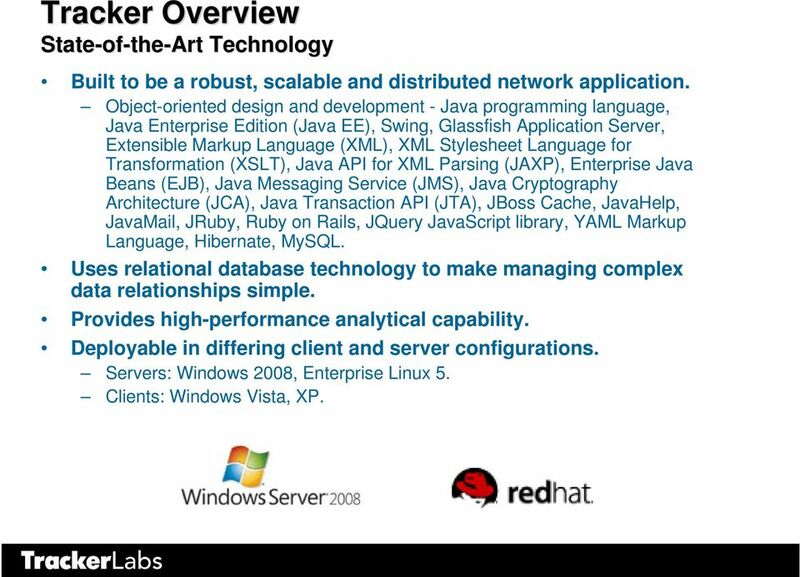 4 What Is Tracker? 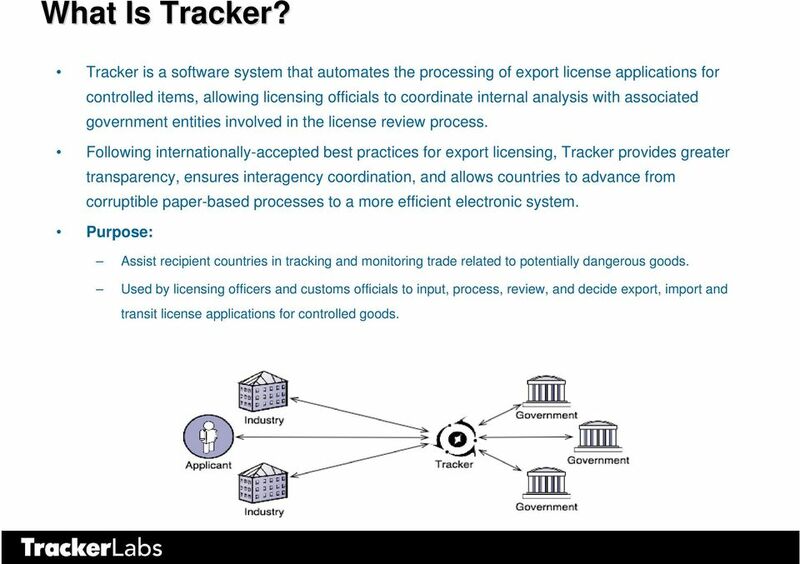 Tracker is a software system that automates the processing of export license applications for controlled items, allowing licensing officials to coordinate internal analysis with associated government entities involved in the license review process. Following internationally-accepted best practices for export licensing, Tracker provides greater transparency, ensures interagency coordination, and allows countries to advance from corruptible paper-based processes to a more efficient electronic system. Purpose: Assist recipient countries in tracking and monitoring trade related to potentially dangerous goods. Used by licensing officers and customs officials to input, process, review, and decide export, import and transit license applications for controlled goods. 5 Tracker Overview Automated Export Control System Began in Deployed in 17 countries: Bosnia, Bulgaria, Croatia, Estonia, Hungary, Kyrgyzstan, Latvia, Lithuania, Macedonia, Moldova, Montenegro, Poland, Romania, Serbia, Slovakia, Switzerland, Vietnam. 3 additional countries being deployed in 2009, including Albania, Georgia and Turkmenistan. Customized in over 20 languages and supports over 30 locales. 6 Tracker Overview Requirements and Objectives The requirements of the current Tracker project are a mix of Technical requirements to bring the Tracker system software up to date. Usability requirements to improve the user experience with the system. New functional requirements to support Customs or Post-Licensing activities. 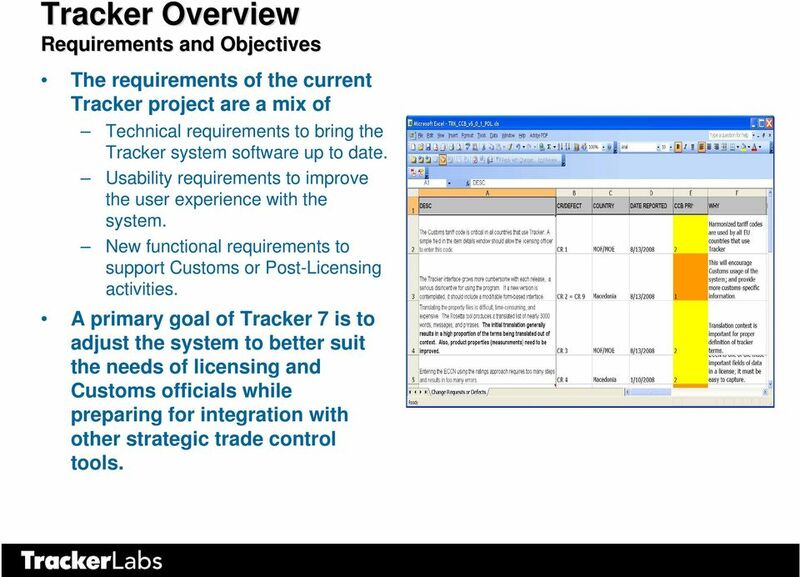 A primary goal of Tracker 7 is to adjust the system to better suit the needs of licensing and Customs officials while preparing for integration with other strategic trade control tools. 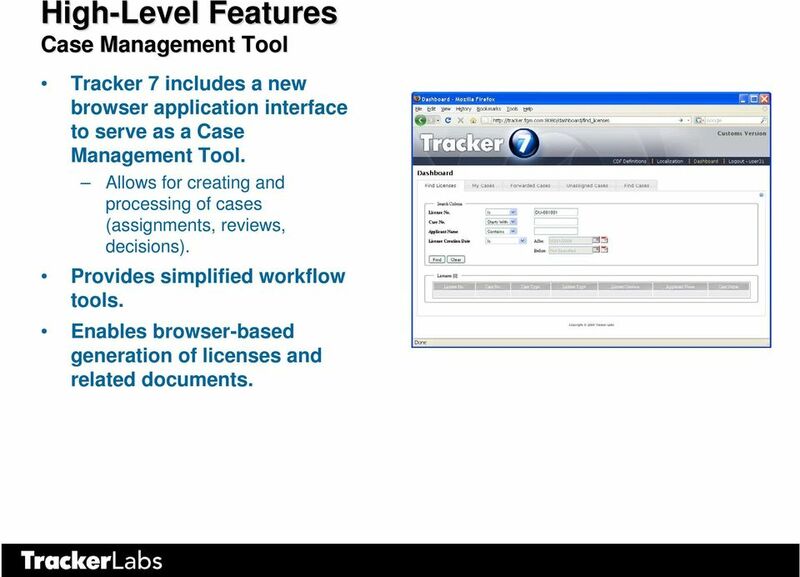 9 High-Level Features Case Management Tool Tracker 7 includes a new browser application interface to serve as a Case Management Tool. Allows for creating and processing of cases (assignments, reviews, decisions). Provides simplified workflow tools. Enables browser-based generation of licenses and related documents. 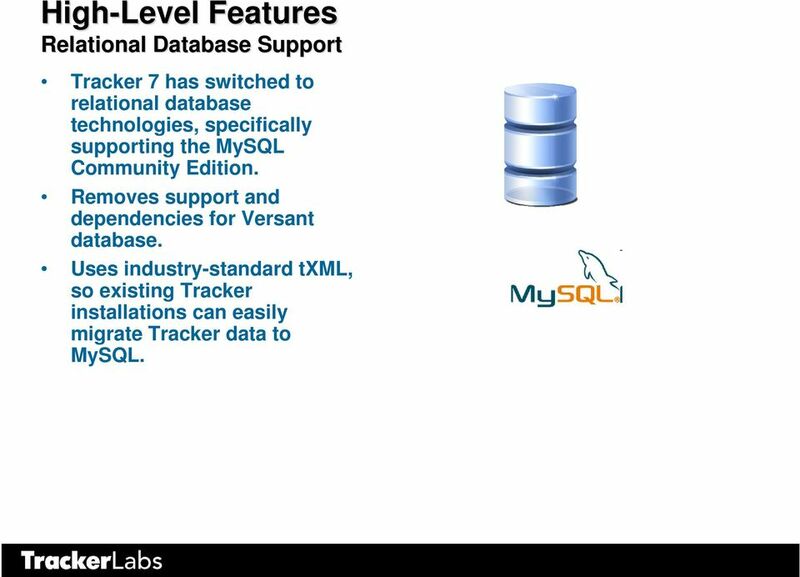 10 High-Level Features Relational Database Support Tracker 7 has switched to relational database technologies, specifically supporting the MySQL Community Edition. Removes support and dependencies for Versant database. Uses industry-standard txml, so existing Tracker installations can easily migrate Tracker data to MySQL. 11 High-Level Features Simplified Internationalization and Localization Locale: set of political, cultural, and regional elements represented in an application. Tracker 7 Case Management Tool contains a localization editor feature. Accessible in-context by clicking on display labels within the browser application. Also accessible in a list format showing all localizable text within the Tracker system. Permissions based. Previous localized terms are used (.properties); only new terms require localization. 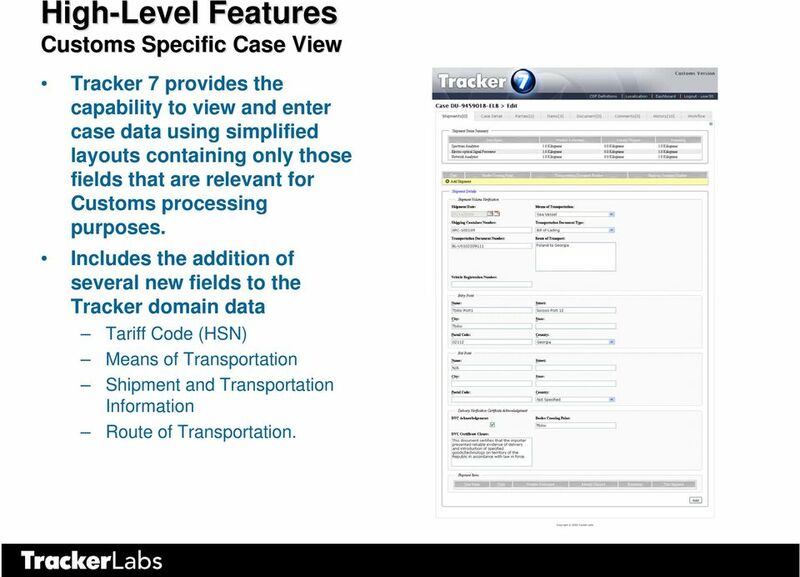 12 High-Level Features Customs Specific Case View Tracker 7 provides the capability to view and enter case data using simplified layouts containing only those fields that are relevant for Customs processing purposes. Includes the addition of several new fields to the Tracker domain data Tariff Code (HSN) Means of Transportation Shipment and Transportation Information Route of Transportation. 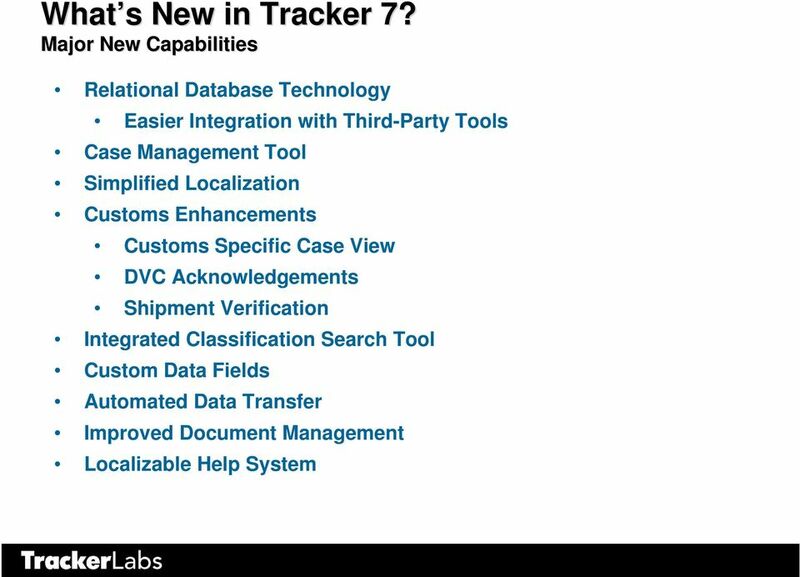 13 High-Level Features Shipment Volume or Quantity Verification Tracker 7 provides support for capturing shipment data. Subtracting volume or quantity amounts from license data as shipments are logged by Customs officials at border points. 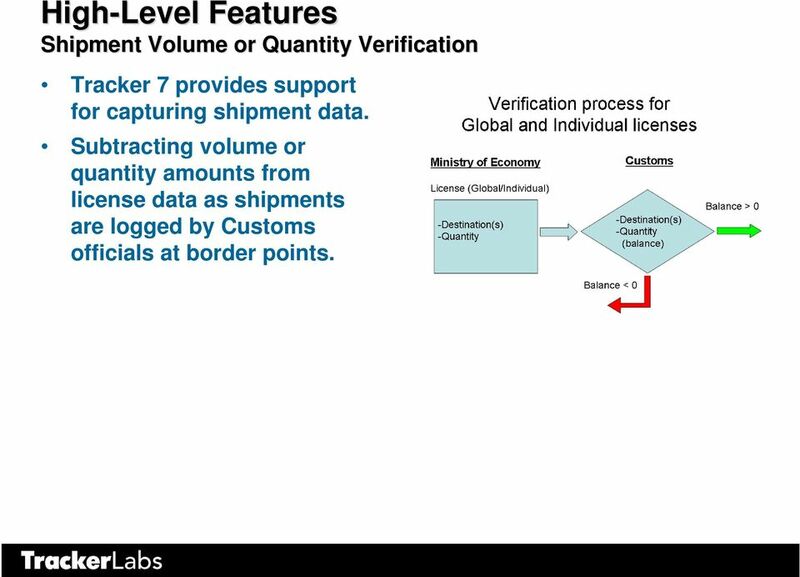 14 High-Level Features DVC Acknowledgement Tracker 7 provides ability for Customs officials to acknowledge Delivery Verification Certificates (DVC) when goods cross borders. Customizable default acknowledgement text can be used, with additional comments added as necessary. 15 High-Level Features Integrated Classification Search Tool Tracker 7 contains a configurable link to the Classification Search Tool (CST). 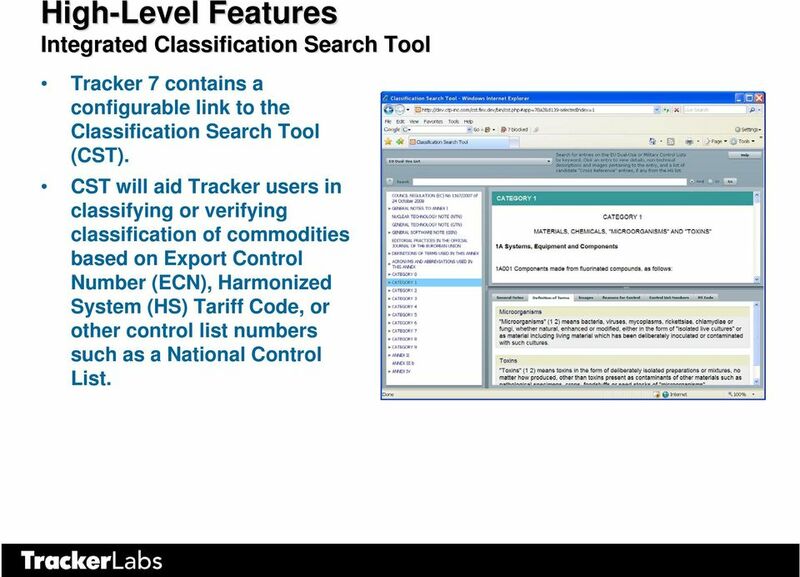 CST will aid Tracker users in classifying or verifying classification of commodities based on Export Control Number (ECN), Harmonized System (HS) Tariff Code, or other control list numbers such as a National Control List. 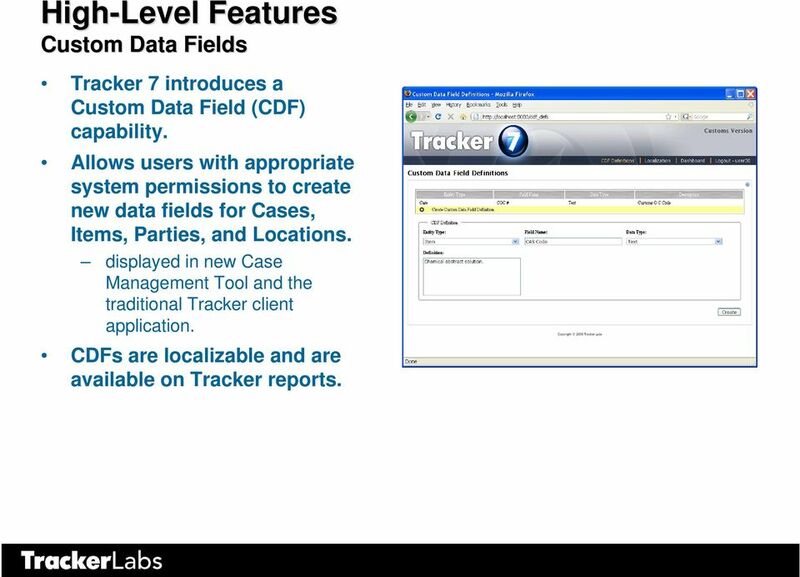 16 High-Level Features Custom Data Fields Tracker 7 introduces a Custom Data Field (CDF) capability. Allows users with appropriate system permissions to create new data fields for Cases, Items, Parties, and Locations. displayed in new Case Management Tool and the traditional Tracker client application. 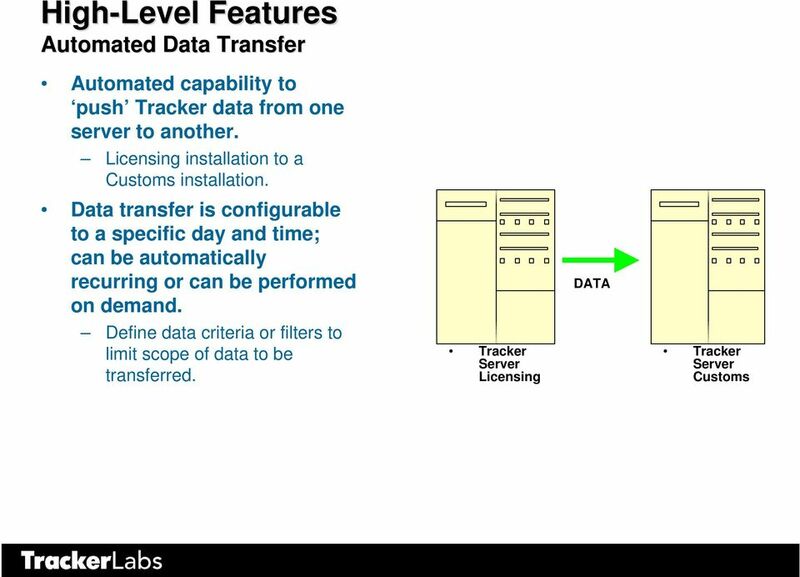 CDFs are localizable and are available on Tracker reports. 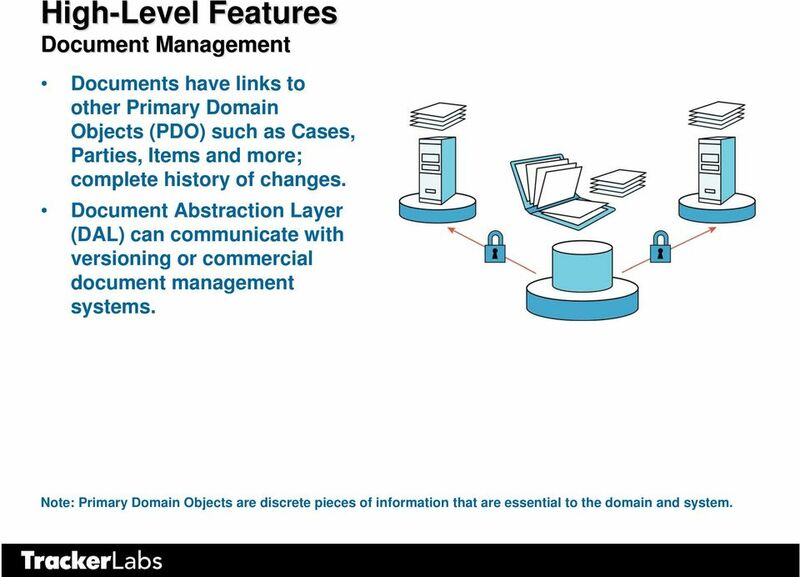 18 High-Level Features Document Management Documents have links to other Primary Domain Objects (PDO) such as Cases, Parties, Items and more; complete history of changes. Document Abstraction Layer (DAL) can communicate with versioning or commercial document management systems. Note: Primary Domain Objects are discrete pieces of information that are essential to the domain and system. 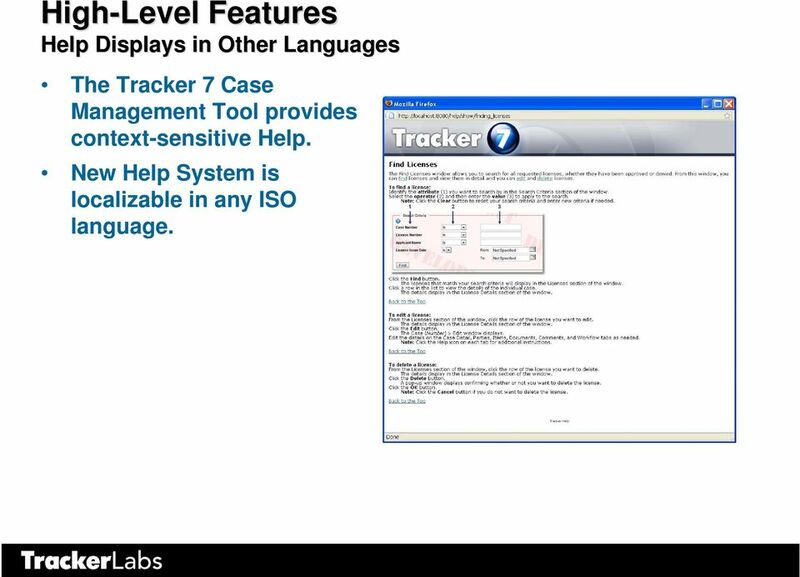 19 High-Level Features Help Displays in Other Languages The Tracker 7 Case Management Tool provides context-sensitive Help. New Help System is localizable in any ISO language. 20 Additional Functionality Complete Object Domain Provides a complete set of relationships between all the major data entities that users work with including parties, products, items, locations and license applications. 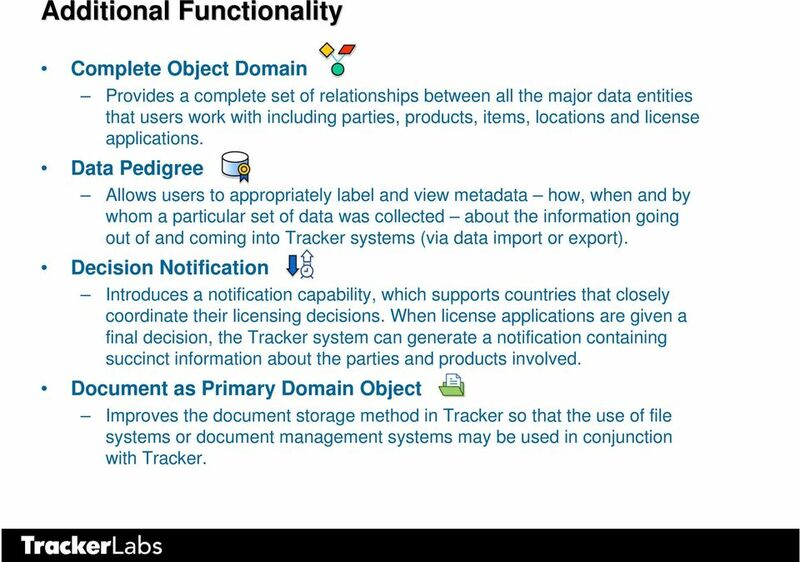 Data Pedigree Allows users to appropriately label and view metadata how, when and by whom a particular set of data was collected about the information going out of and coming into Tracker systems (via data import or export). Decision Notification Introduces a notification capability, which supports countries that closely coordinate their licensing decisions. When license applications are given a final decision, the Tracker system can generate a notification containing succinct information about the parties and products involved. Document as Primary Domain Object Improves the document storage method in Tracker so that the use of file systems or document management systems may be used in conjunction with Tracker. 21 Sharing Information Using Open Standards XML (Extensible Markup Language) represents an industry standard to exchange information across disparate systems. Provides a simple and portable mechanism for transferring data between different applications and users. 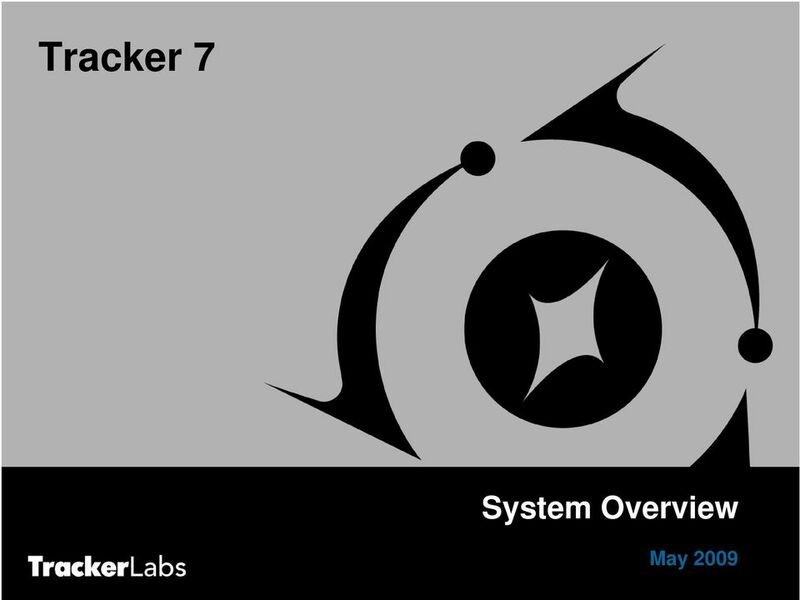 Tracker 7 allows like or disparate systems to share data, and utilize third-party tools such as Crystal Reports. Uses the Controlled Trade Markup Language (CTML) and the Tracker Markup Language (txml). 22 Sharing Information Supporting the Tracker Community TRACKERNET provides support for the entire user community - source of programmatic information as well as technical resources. Current Tracker training guides and system documentation, frequently asked questions (FAQ), discussion forums and other useful resources. Request support or submit a suggestion directly to the Tracker Help Desk for assistance. Java in Web 2.0. Alexis Roos Principal Field Technologist, CTO Office OEM SW Sales Sun Microsystems, Inc.
How to Prepare for the Microsoft Dynamics CRM Online Fall 13 Service Update. COMPANY: Microsoft Corporation RELEASED: September 2013 VERSION: 1.